US Census estimates that 11 percent of District’s population are seniors—that is approximately 75,000 District residents. The number of seniors in the District moved up and down with the population, but with some lag. 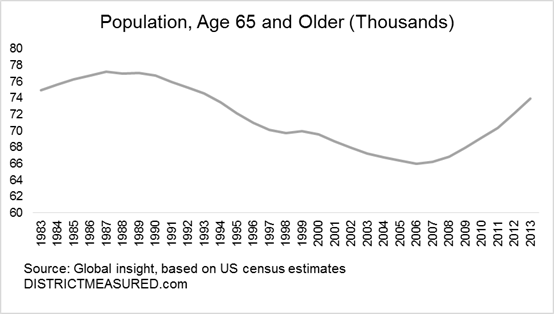 Still, senior population has remained relatively stable, varying between 78,000 during mid-80s, down to 68,000 during mid-2000s, and now back up, although they are now slightly a smaller share of the entire population (through mid-90s, seniors were approximately 13 percent of the population.) The recent increase in the senior population is most likely coming from baby boomers and they look very different from the seniors of 2000s. Seniors today have a different economic profile. As a group, they are richer. In 2001, only 3,196 seniors had incomes ranked among the top ten percent of earners in the city. In 2012, this number more than doubled to 7,541. District population and the number of tax filers also increased during this period, but nowhere nearly by that much. Today’s seniors work into their later years and have more access to capital markets. Income disparities among the District’s seniors have also increased since 2001. 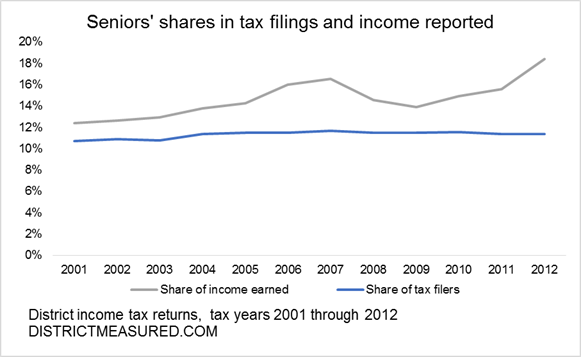 A larger share of seniors are filing income taxes. In 2001, there were approximately 69,000 seniors in the city compared to approximately 26,000 senior income tax filers (the filer is a senior, or the spouse is a senior, or both claiming to be 65 or older). That was about 39 percent of the total senior population. 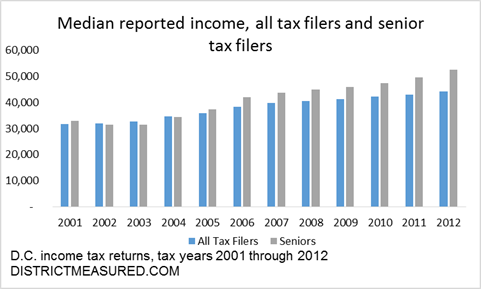 Senior population in 2012—the last year for which we have tax data—was only 3,200 more than 2001, but the number of senior tax filers the same year had increased by 11,233. Why would we see such an increase? 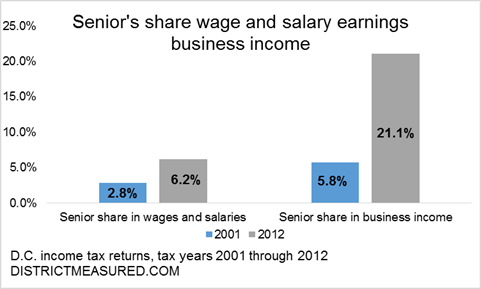 First, senior earnings are increasing because they work past retirement age. Tax filing data provide some evidence of this. In 2001, seniors accounted for only 2.8 percent of the wage earnings in the District; in 2012, they account for 6.2 percent. Similarly, seniors only accounted for 6.2 percent of the business income reported in the District in 2001, and in 2012, their share was 21.1 percent. Second, the household size for seniors is declining, with more becoming empty nesters. More seniors are filing as singles: In 2012, 60 percent of all senior taxpayers filed under the single filing status—an increase of 7467 compared to the number of seniors who are filing as singles in 2001. District’s tax filers also increased during this period. We have more residents who are employed (see here, and here), both because of increases in the population, and because more low-income earners file tax returns to take advantage of local earned income tax credit program, which began in 2003 and was expanded in 2006. Still, the changes among the seniors is much more dramatic compared to the entire population. Seniors now account for a larger share of income earned in the District. The share of tax filers, who identify themselves or their spouses as seniors, have remained stable, at 11 to 12 percent, between 2001 and 2012. However, seniors now account for 18 percent of all federal adjusted gross income reported in the District, compared to 12 percent in 2001. Why are seniors’ income so sensitive to the economic booms and busts as we see in the graph? 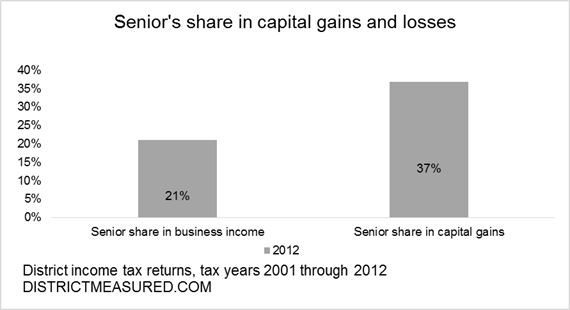 Tax data suggest that capital gains (and losses) are now a larger share of senior income: Seniors accounted for 37 percent of the capital gains in the city in 2012 compared to 21 percent in 2001. This data point us to another shift in the socioeconomic make-up of the seniors. Seniors have more access to capital markets, and the share of seniors on fixed incomes appear to be declining. Seniors are getting richer relative to all residents, but income disparities among seniors are also increasing. Through 2005, the median income of seniors was similar to that in the entire city. This began changing in 2006, and since then, median incomes among the seniors have been increasing faster. In 2012, senior median income was $52,500, or 19 percent higher than the $44,000 reported among all residents. The income gap between the poorest and the richest seniors have been widening since 2001. To show this, we compare the income threshold to join the top ten percent earners to the threshold for the bottom ten percent. Usually top ten percent earners make in multiples of the bottom ten percent. In 2001, for the entire city, anyone who earned $110,655 or more (in 2001 prices, not adjusted for inflation) was among the top 10 percent of the earners and anyone who reported less than $7,106 was in the bottom percent, producing a ratio of 15. Among the seniors, the gap was smaller ($125,240 v. $10,248), producing a ratio of 12. Since then, the income gap has become greater for everyone ($162,545 v. 8952, with a ratio of 18 in 2012), but for seniors, it is now higher than the entire city. The 90th percentile threshold for seniors increased to $221,137, while the 10th percentile threshold, at $10,192 in nominal terms, is less than what it was in 2001, producing a ratio of nearly 22! What exactly is this data? 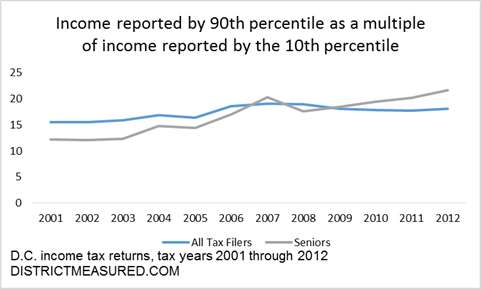 We use income tax return data for tax years 2001 through 2012. 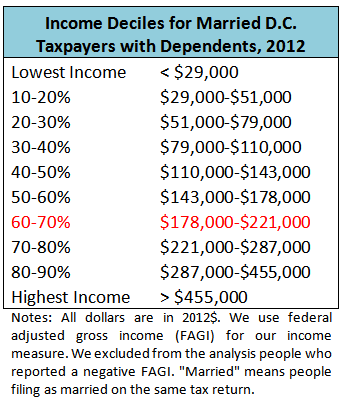 The analysis is based on federal adjusted gross income. We use this metric because it includes social security and pension earnings (for which District offers a deduction) and it also accounts for the full-year earnings of those who moved into the city in the middle of the calendar year.